If you sit this way, you may have to pay. Transit authorities are now authorities on civility. Tell your mother she’s been replaced; public transportation authorities are now in the business of punishing bad manners. Their cause of the day: “manspreading”. The term, meant to describe the practice of sitting with legs wide apart, wasn’t even in the dictionary before 2015. In what must be record time, “manspreading” has evolved from a slang term to law. 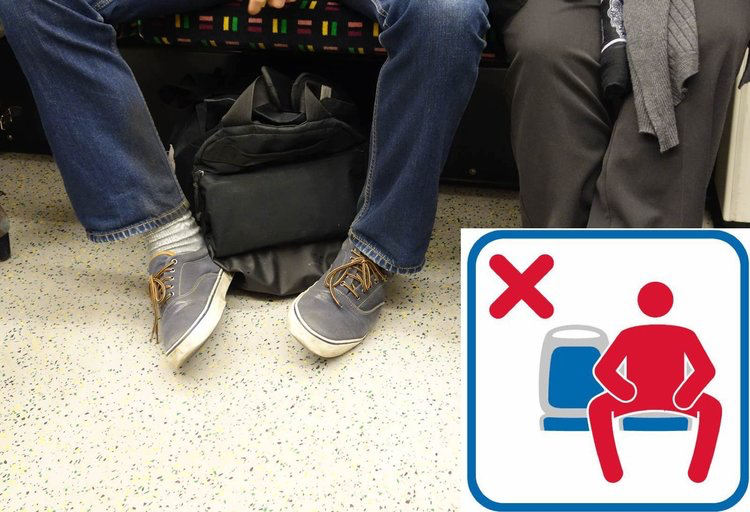 Authorities in Seattle, New York City, and most recently Madrid, Spain have launched anti-“manspreading” campaigns. This is in addition to the online shaming campaign transgressors are subject to around the world (#manspreading). All of this for a practice that, besides raising an annoyed person’s blood pressure, poses no danger to others. I am the first to say that taking up more space than necessary when sitting on public transportation is discourteous and looks unflattering. At the same time, I do not assume that sitting like a slouch is always a product of malice or disregard for others. The fact is that anatomy, size, habit, and emotional state can all contribute to the way we sit. Teaching manners requires patience and giving people the benefit of the doubt. Such enforcement measures demonize everyone who doesn’t sit in the prescribed manner. If we are on the task of fining people for things that irritate us, I propose banning smelly tuna sandwiches on busses, people who whistle in public, and subway riders whose purses require their own seat. We all have things that annoy us, and surely we do things, however trivial, that peeve others. While the decline of civility is concerning, I am equally troubled by the trend of codifying good manners and fining or shaming people into compliance. Sit as upright as you can, and do it because you want to be respectful and look respectable. Money spent on a fine is much better spent on an etiquette coach.